061023-2, originally uploaded by MollsMusings. 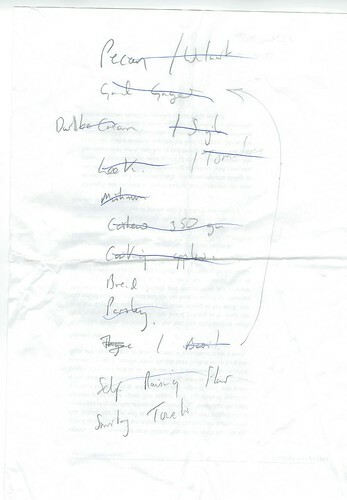 All items crossed off other than the bread and Sanitary Towels. 061023-1, originally uploaded by MollsMusings. Si and Kate get different types of bread each. K's amazing pasta sounds interesting. 061023, originally uploaded by MollsMusings. 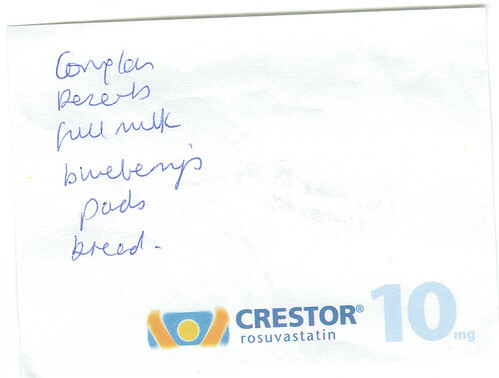 Crestor rosuvastatin is for reducing your cholesterol. 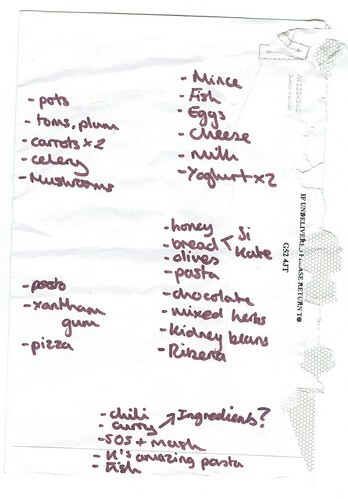 Do you think the author of this list was a doctor or nurse who brought a post-it note home from work? Complan and blueberries are healthy, not sure about the full milk. Were they really wanting 'deserts'? Sahara, Gobi.....? Or perhaps they were leaving, deserting?